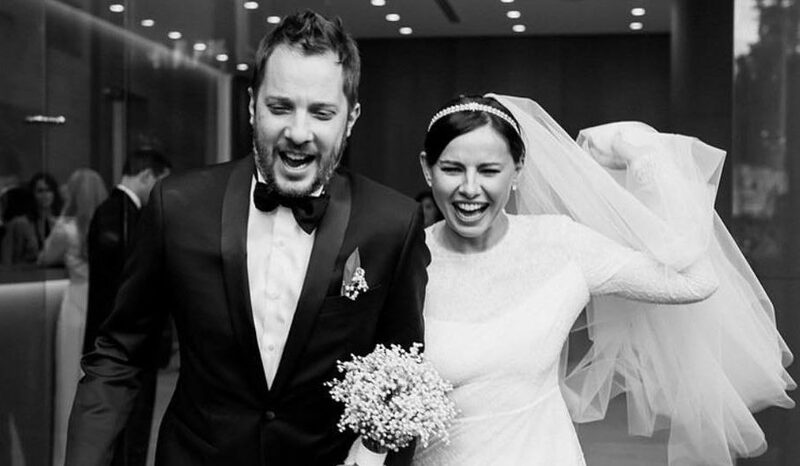 On June 11, the founder of the company "RusModa" Oksana Lavrentieva and writer Aleksandr Tsypkin played a wedding. Their romance began in the autumn of 2017, and today celebrities congratulate them on a new chapter in their life. 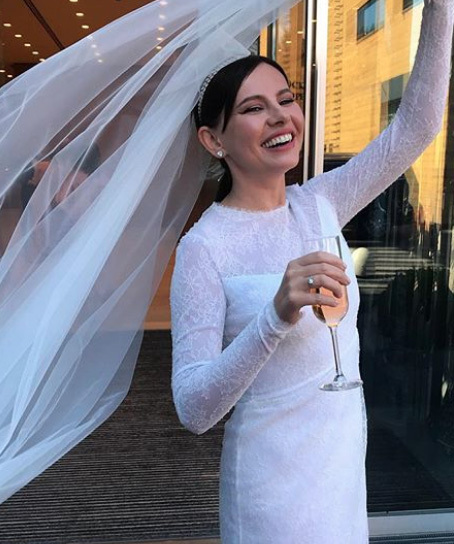 How many dresses did she have, in which registry office Oksana and Alexander officially legalized their relationship, which of the stars came to the celebration - all the most interesting facts in our article. "I'm terribly nervous", - Oksana Lavrentieva reported this morning to her followers on Instagram. It's understandable - the wedding day has come! Oksana was going to the Center of Health and Beauty "White Garden" (Lavrentieva owns it). 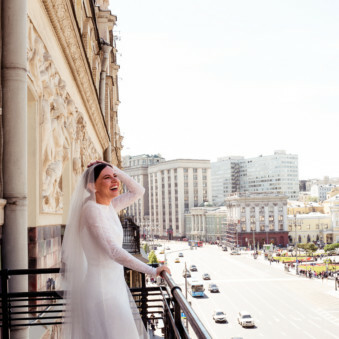 But the bride's makeup made Elena Krygina, the close friend and professional of her business. Oksana and Alexander refused from the open air wedding ceremony. Together with the bridesmaids and friends of the groom, they first appeared at the registry office, and only then went to the restaurant. Lavrentieva and Tsypkin officially legalized their relationship at the Moscow Marriage Palace No. 1, which is located in Barvikha. On the day of the wedding, the bride, as expected, was in white. For several hours she managed to change four outfits. 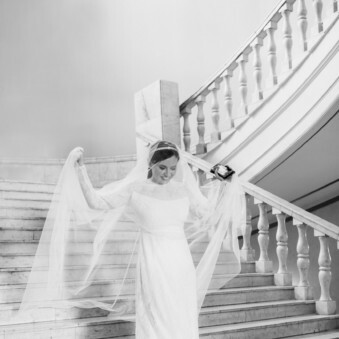 Lavrentieva came to the registry office in an elegant lace dress just below the knee. The look was complemented by an elegant diadem-bezel, a long veil and a bouquet of lilies of the valley. Later, the bride posed in an elegant dress with a flowing skirt, a nightie dress and a shiny mini. 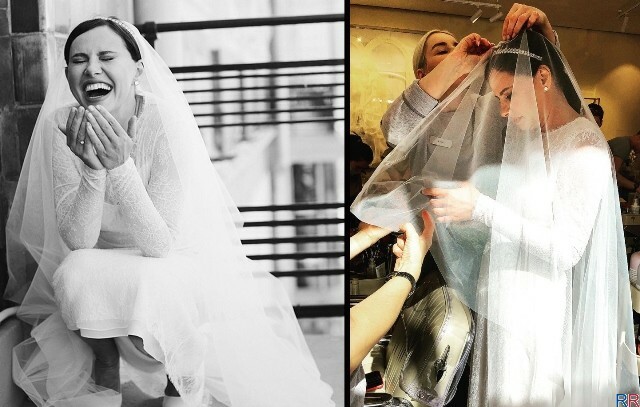 "Thanks to my incredible "RusMod" team for their help with the wedding and, of course, Atelier Moscow dresses, which were personally supervised by Alexander Terekhov". 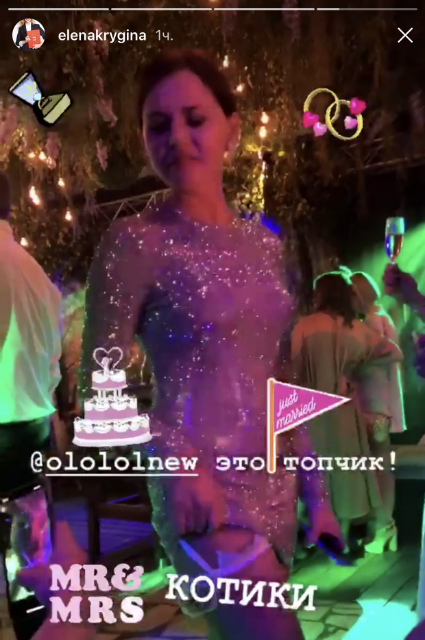 Ksenia Sobchak and Maxim Vitorgan, Svetlana Bondarchuk, Nadezhda Obolentseva, Nika Belotserkovskaya, Polina Kitsenko, Alena Doletskaya, Alexey Kiselyov, Ingeborga Dapkunaite ... In short, everyone came to the wedding of Lavrentieva and Tsypkin! "This is the most beautiful and funniest wedding ceremony I've ever seen. Oksanochka and Alexander, this is very cool, I congratulate you!" - wrote Dima Bilan's producer Yana Rudkovskaya. "I'm here on a swing posing in a beautiful dress, and, it turns out, from love to the wedding - just one step. Only six months and today. I hope, for a long time and seriously. Although Oksana probably already knows that Tsypkin can not be serious - he is forever rocking... But maybe this is for the best - Oksana is extremely happy all year round! A pleasant and unexpected surprise for the guests of the wedding was the appearance on the stage of Mikhail Boyarsky, who performed for the audience a few of his hits. I do not believe! What I see, - Sati Spivakova was amazed, who could not help sharing her video with the artist. The group "Leningrad" headed by Sergei Shnurov also entertained the guests. Wedding celebration took place at the Arkadiy Novikov and Artem Mikhalkov's restaurant "Veterok". This day, this space became like a real mysterious forest - everywhere dangling greens and flowers.